The Folies Bergère is a Parisian music hall which was at the height of its fame and popularity from the 1890s through the 1920s. As of 2008 the institution is still in business. The Folies Bergère inspired the Ziegfeld Follies in the United States and other similar shows. One of its most popular representations, Édouard Manet's 1882 well-known painting A Bar at the Folies-Bergère depicts a bar-girl, one of the demimondaine, standing before a mirror. Located at 32 rue Richer, in the 9th Arondissement, it was built as an opera house by the architect Plumeret. It was patterned after the Alhambra music hall in London. It opened on 2 May 1869 as the Folies Trévise, with fare including operettas, comic opera, popular song, and gymnastics. 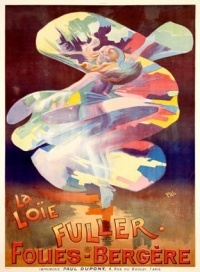 In the early 1890s, the American dancer Loie Fuller starred at the Folies Bergères. 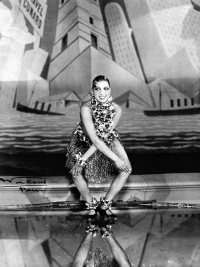 Nearly thirty years later, Josephine Baker, an African-American expatriate singer, dancer, and entertainer, became an "overnight sensation" at the Folies Bergère in 1926 with her suggestive "banana dance", in which she wore a skirt made of bananas (and little else). Other notable Folies Bergères performers have included singers Maurice Chevalier and Louisa Baileche, and comedian Cantinflas. The Folies Bergère inspired the Ziegfeld Follies in the United States and other similar shows, including a long-standing revue at the Tropicana Resort & Casino in Las Vegas. Unless indicated otherwise, the text in this article is either based on Wikipedia article "Folies Bergère" or another language Wikipedia page thereof used under the terms of the GNU Free Documentation License; or on original research by Jahsonic and friends. See Art and Popular Culture's copyright notice. This page was last modified 14:24, 28 October 2013.